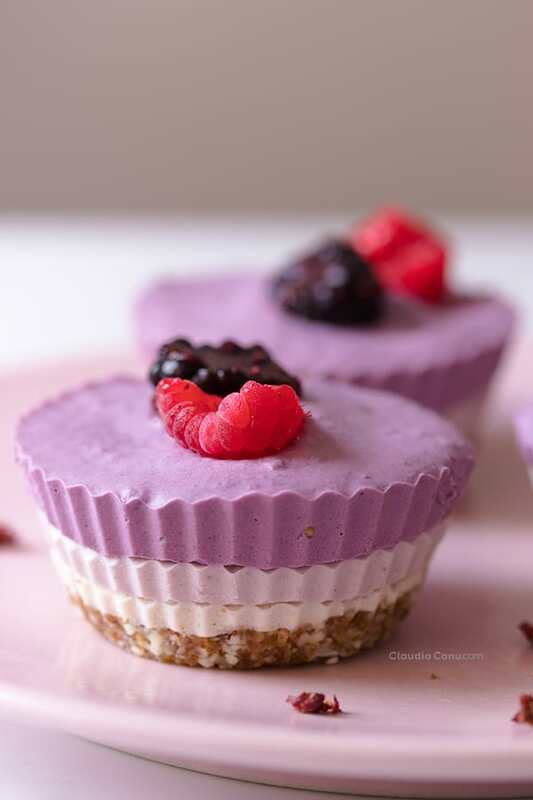 These no bake tricolor mini cheesecakes are ideal to enjoy during the hot summer days, and since they are vegan and gluten-free, they are also the perfect option when you have guests who follow different diets; although, I assure you that everyone will just love them. You can also add this recipe to your Healthy Meal Plan and have your snacks covered for many days. 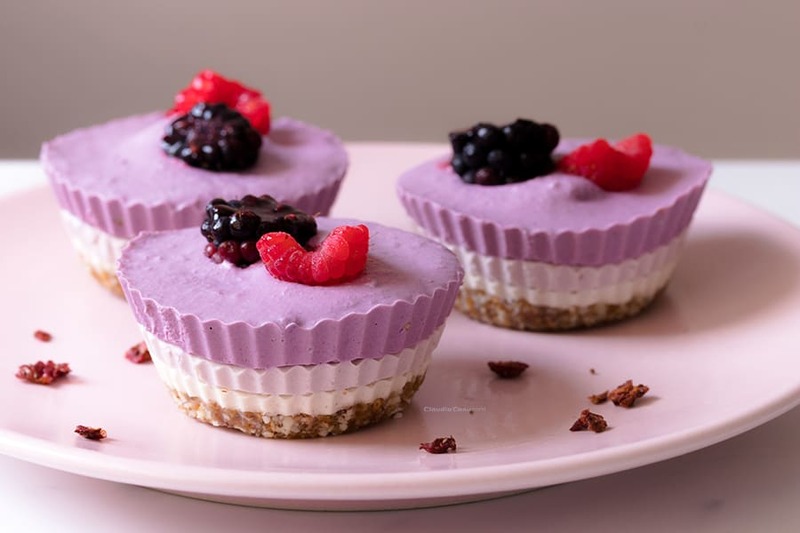 As you can see in the video, to prepare these mini cheesecakes you do not need special culinary skills. 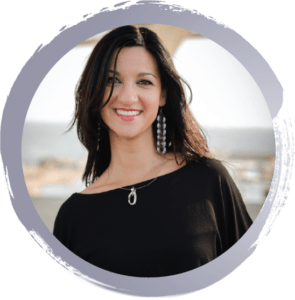 You just need to be a little patient and respect the freeze times so that you can get the three separate layers; that is if you want to do this exact version of the recipe. Another simpler option to reduce preparation times is that you choose only the one flavor that you prefer. This way, you will only have to wait for the final solidification time. Keep in mind that, before you start to work on the recipe, you’ll need to remember to soak the cashews in water for at least 4 hours. Prepare the base of the cheesecake. Place it in the mold. Place it on top of the base. Leave it in the freezer until the filling is solid. Keep in mind that you should take it out of the freezer about 10 minutes before serving it. 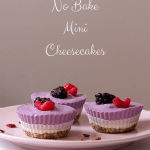 Why do I consider these mini cheesecakes to be healthy? 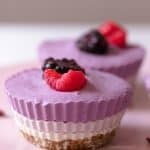 The main reason why I consider these mini cheesecakes to be healthy is that they are prepared with the healthy fat of nuts and coconut. In addition, the only sweetener they have is just a spoonful of maple syrup for the 8 mini cheesecakes, which means that the amount of sugar per serving is very small. However, they have a sweet flavor because they are made with dates and vanilla in the base, and coconut, fruit, and vanilla in the filling. In fact, I think that the sweetest flavor to these mini tricolor cheesecakes is the pure vanilla. Do you know that what we usually find in supermarkets as vanilla is usually an aroma? This means that it’s made in a laboratory and possibly contains sweeteners and preservatives. Pure vanilla, in fact, is very expensive, but the difference in taste is incredible and a very small amount provides a unique sweetness and aroma. 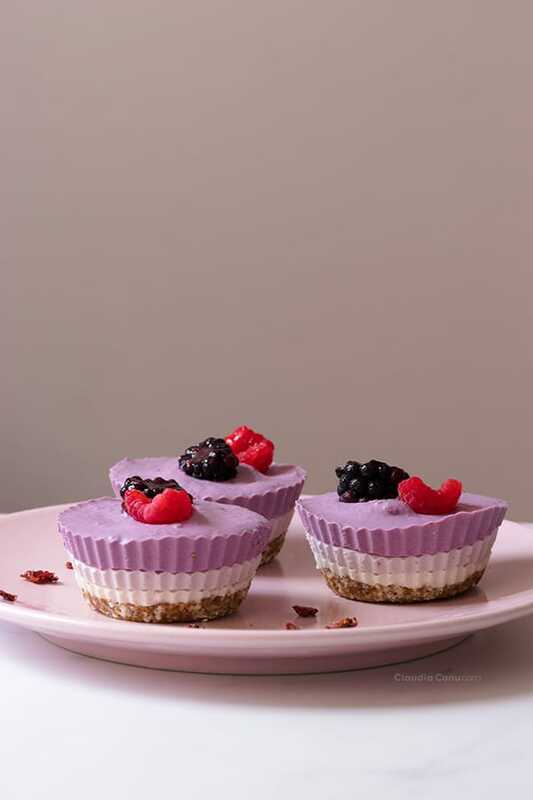 You could possibly already know my recommendation; although these mini cheesecakes are healthy, eat just one portion at a time and remember to maintain a balanced and varied diet. The best way to store these cheesecakes is to leave them in the freezer where they can stay for a few weeks, if you don’t eat them before, of course. Keep in mind that once you take them out of the freezer, even if you leave them in the fridge, it’s better to consume them within a couple of days. As these cheesecakes have to be served cold, they don’t make the best option for a picnic or leaving them on a table in a buffet. But they are a great option if you have been invited to someone’s house. Just remember that you need to ask your host to keep them in the fridge. Anyway, I assure you that they will be so successful that you won’t need to store them for a long time. 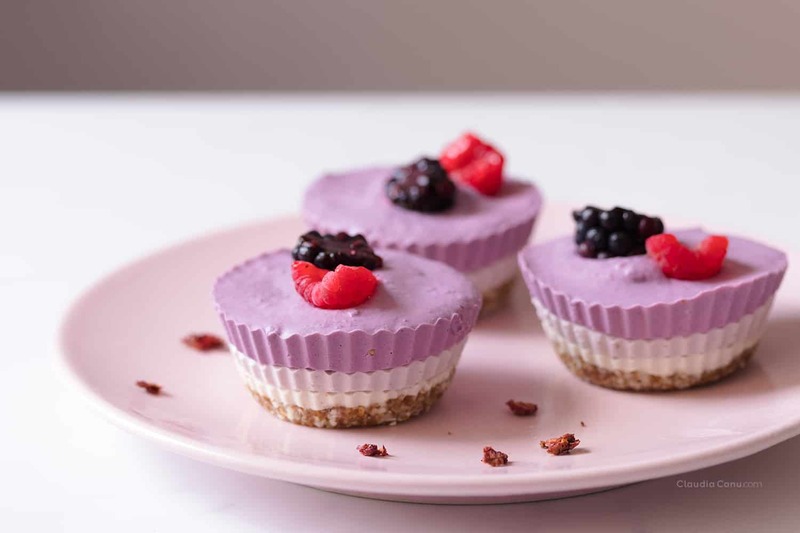 It was very interesting to experiment with these mini cheesecakes while offering them to several people to see their reactions while trying the first bite. Once, I brought them to my coworkers to try, even if none of them usually eat healthily. Well, they were a success! In addition, that day I had also taken a cake that I bought in Bali and I served them together. I was surprised, and it made me very happy, to see how everyone took the mini cheesecake first and, when there was still more Balinese cake left, they asked me if there were more fruit cheesecakes left to eat. On another occasion, I took them to a friend’s barbecue and left before my friend tasted them. Well, he wrote me a few days later just to tell me that he loved them! When I was still very addicted to sugar and industrial foods, I remember how eating something similar didn’t give me any pleasure and I didn’t find the sweet taste at all. 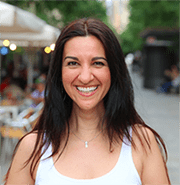 That’s why I love being able to create recipes that anyone likes, even people who usually don’t follow a healthy diet. Of course, the fact that these mini tricolor cheesecakes are so cute helps to encourage people to try them and to possibly influence the way they taste. For the filling, you could try using any other fruit, although I think it would be better not to use one that is too watery. I tried a version with a layer of strawberries and one of blueberries and they also came out delicious. I confess that the reason why, in the end, I decided on raspberries and blackberries is because the colors stand out more and it looks better for the photos 😉 The blackberries are the ones that give the darkest color and if you want a stronger pink color, you can add a bit of beetroot that will bring a lot of color, but almost no flavor. And, as I told you at the beginning of this post, you don’t need to do the three layers; you could do just one or two. Of course, the three layers do call for attention, don’t you think? For the base, if you don’t have almonds, you can use some other nut, such as hazelnuts or walnuts. What you have to keep in mind is that the proportions are 1:1, one part of nuts and one part of dates. About the coconut cream, I once found in an organic store what they called coconut cream. However, the easiest thing is to buy canned coconut milk (I recommend it to be organic) and leave it in the fridge for at least a couple of hours. When you open it, you will see that a more solid cream will have formed on top. That’s the one you have to use for this recipe. And if you’re already wondering what you can do with what’s left of the milk, I love adding it to my breakfast oatmeal or you could use it in an Asian-style dish, like a curry or a dahl. 1. Add all of the ingredients of the base in a food processor and process until you get a sandy consistency that sticks if pressed between your fingers. Place this dough at the base of the molds and press it well with the help of a spoon. 2. Store the molds in the freezer while you are preparing the filling. 3. Add all of the ingredients of the filling, except the fruit, in a food processor and process until a cream has formed. 4. Place a spoonful of the cream in each mold and return them to the freezer for at least 20 minutes. 5. Add the raspberries to what was left of the filling in the processor, and process until they are fully blended. 6. Place a spoonful of raspberry filling on top of the first layer of the cheesecakes, making sure that the first layer is solid. 7. Place the molds into the freezer again. This time it may take about 30 minutes until the filling is somewhat solid. 8. Add the blackberries to what is left of the filling, processing until they are blended and store it in the fridge. 9. 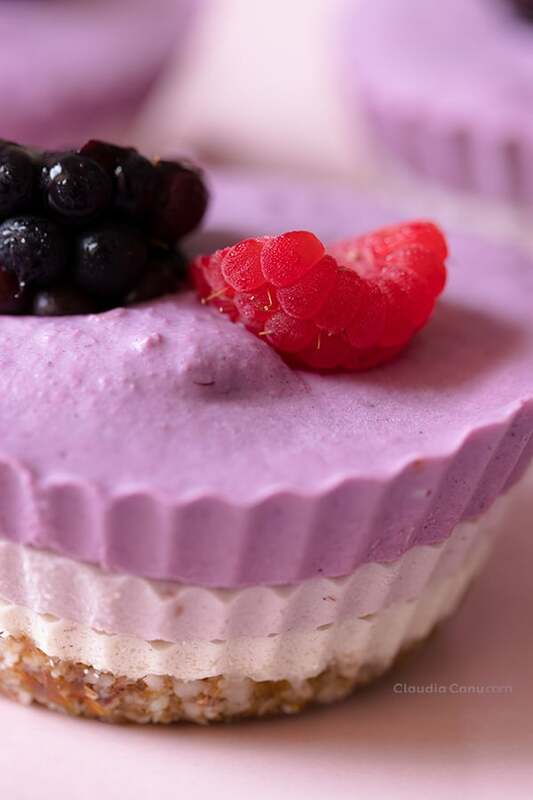 When the raspberry filling layer is solid, add a tablespoon of blackberry filling. 10. Add the fresh fruit on top. 11. Place the molds in the freezer for at least 2 hours. 12. Remove the cheesecakes from the freezer 10 minutes before serving. * If the dates are very dry, you can hydrate them for 10 minutes in hot water. ** Soak the cashews in water for at least 4 hours. *** The easiest way is to buy a can of coconut milk and leave it in the fridge. You will see how a somewhat solid cream will form at the top. OMG, these little cuties look like food for healthy princesses! I absolute adore them and I’m sure my daughters will love them! Thank you for this great recipe! I’m so glad you like them, Cintia and I hope your daughter will also love them!